Marie Junaluska, respected teacher of the Cherokee language, culture and history, grew up in the Wolftown Community of the Qualla Boundary in western North Carolina. She spent her high school years in boarding school at the Riverside Indian School in Anadarko, Oklahoma. She is the recipient of the Peacemaker of the Year Award and has served as a Tribal Council member representing the Painttown Community. She has also consulted for the permanent exhibits of the Museum of the Cherokee Indian and the National Museum of the American Indian in Washington, DC. She has a special interest in teaching young people and is one of the elders who supports Du-yu ko-Dv-i, The Right Path leadership program for young Cherokee leaders. Marie Junaluska speaks Cherokee fluently and writes the Sequoyah syllabary. In her presentations, she introduces the Cherokee language, incorporates activities based on Cherokee history and culture, and teaches songs in Cherokee. She enjoys working with groups of all ages. Growing up in the Wolftown community of the Qualla Boundary, Marie Junaluska spoke only Cherokee until she attended the Soco Day School at age seven. She spent her high school years at boarding school in the Riverside Indian School in Anadarko, Oklahoma, where she met people from many Indian nations. Since the 1980s, she has taught the Cherokee language to students in Cherokee schools. 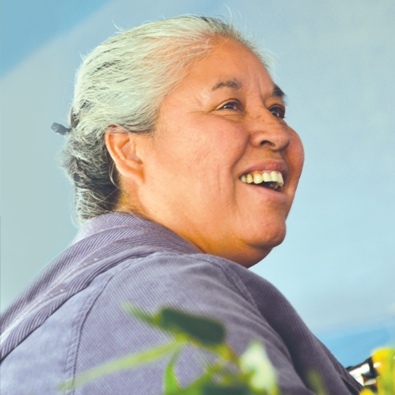 From 1981 until 1996, she served as the Indian Clerk and Interpreter for the Tribal Council, training with Maggie Wachacha, the previous Interpreter. Since 1997, she has served as an elected member of the Tribal Council of the Eastern Band of Cherokee Indians, representing the Painttown Community. Marie Junaluska has presented educational programs throughout North Carolina, Tennessee, and Georgia. She is an outstanding translator and educator and has worked with Special Collections at Western Carolina University, translating articles in the Cherokee Phoenix (published 1828-1834) from the Cherokee syllabary into English. One of Marie Junaluska’s translations into the Cherokee language and syllabary was featured in Living Stories of the Cherokee. She has served as a consultant on many projects, including the permanent exhibit at the Museum of the Cherokee Indian, the museum’s website, and film projects by Disney Imagineering. She helped the Smithsonian Institution develop a Cherokee Indian exhibit for the National Museum of the American Indian in Washington, D.C.